Most if not all GDO's do not like MSW inverters. Stalling mid stroke, phantom reverseing and such. Some GDO's don't even like a refridgerator plugged into the same wall circuit they share. Thanks for the link to the regulator -- that looks like a small, bells-and-whistles-less charge controller. I think it is the sort of thing I would try for the DC GDO (although I'd need one bigger than 7A for even the one 125w panel I'm planning to start with). It supposedly has to do with the RPM sensor circuit sensing an obstruction. A pulse counter with a flag attached to the drive motor shaft....Slow the motor down and it will stall and or reverse. And I would expect the 7A size would be more than sufficient... You would be charging the Main batts as well if my memory serves me. 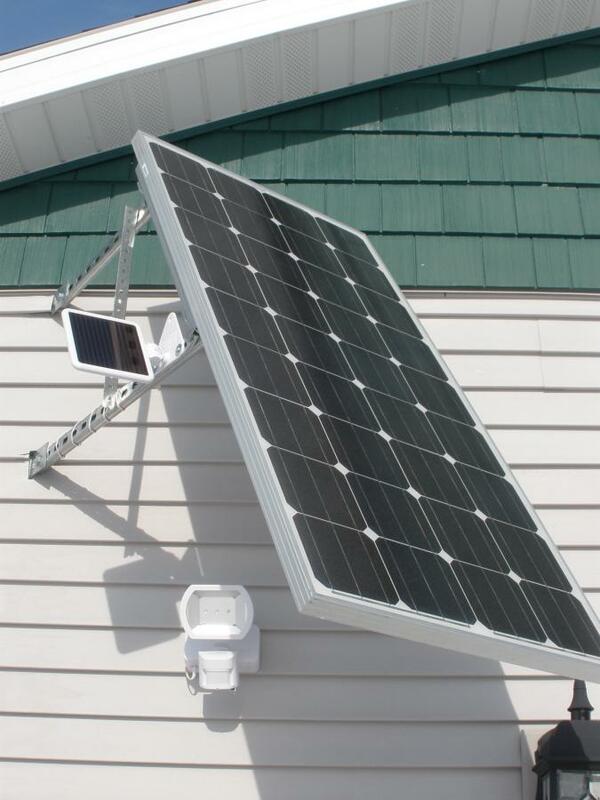 It would cost me under $1000 to run power from the house (need to run a line under a road), so I'm trying to keep the budget for solar near this. That's your answer. Spend the $1,000 and be done with it. Update: the Xantrex X-Power 1500w MSW inverter fires my 1/2hp garage door opener quite well! I haven't tried with anything else drawing power at the same time, though (I did just one quick test since the PV panel isn't installed yet). I'm really glad you updated this. So many posts remain open ended and it's good to see results! I too have tried an MSW inverter on an opener at new construction since last we spoke. I found I needed to increase the close/open force settings in order to get it to run well through the dozen cycles without stalling. Please keep in touch after your machine has had a steady diet of this MSW inverter? Update: after a month of use, the system is apparently running well, and is doing what we want it to do. The charge/lighting controller is running a 16w DC light 4 hours a day. 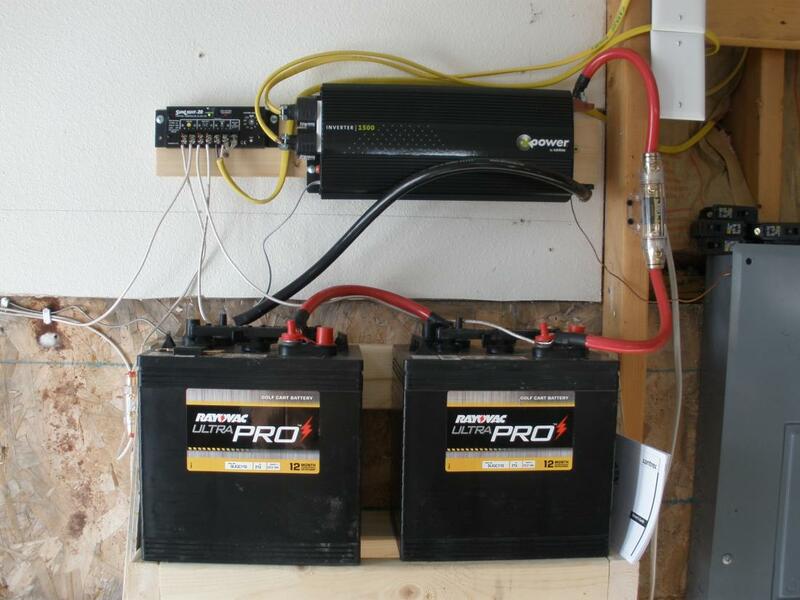 The X Power 1500 inverter powers the garage door opener without trouble. I wired about 8 AC outlets to the inverter and put a shoplight over the workbench so I can work on the chain saw. I added a separate motion sensing PV LED light over the person-door to the garage (which is right under the main PV panel), since we are in the habit of shutting off the inverter when all the cars are in the garage. I made a mount for the panel out of Power Strut, and it has held up to 40mph wind gusts a couple weeks ago. Figuring out how to tilt the panel 60 degrees from horizontal as well as pointing it south (which if I recall is something like a 35 degree angle from the wall it is mounted on) took about as much geometry as I know, and then a bit more. Total expenditure was about $950 including the LED motion light. I'll bet this is about as thrilling as a solar pocket calculator to many of you solar veterans, but I'm still pretty excited about it. Thanks for all the help!